Here are cheap deals for the Wotofo Profile Mesh BF RDA. The result of a partnership between MrJustRight1 and Wotofo, this new mesh RDA features a mesh compatible coil deck, a BF squonk pin, an exquisite design and beehive style airflow. What sets the Profile RDA apart from the crowded field of rebuildable dripping atomizers is the fact that it features a wide clamp style deck with dual posts that works with both mesh style wire or standard coil builds. The wire terminals on the posts measure 7mm x 2mm and coils are held in place via side Phillips head screws. The positive post is also made with peek insulation for heat resistance and there is central ceramic support. With purchase, you will receive mesh style coil sheets that have a resistance of 0.18ohm, measure 6.8mm x 16mm and fire in the range of 40 to 60 watts. Airflow to the deck occurs by way of 2 x 19 beehive style airflow slots that measure 1mm each. 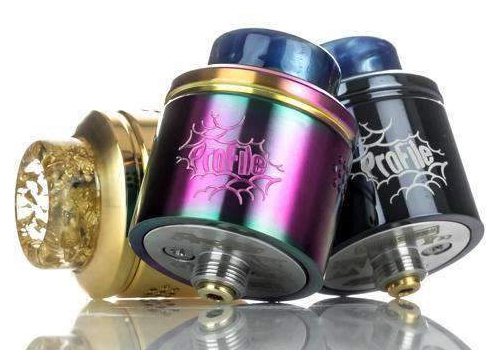 Design-wise, the Profile RDA measures 24mm in diameter and is available in a plethora of colors such as black, blue, gold, gunmetal, rainbow and silver. The side features a laser engraved Profile logo which really turns heads. At the bottom of the Wotofo Profile, there is a 24K gold plated BF 510 connection pin for use with your favorite squonker. With purchase of the Wotofo Profile, you will receive two 9mm wide 810 drip tips. Additionally, you will find a single 6mm agleted cotton strip, a mesh bending tool, two clapton coils, two mesh style coil sheets, extra parts and a manual.